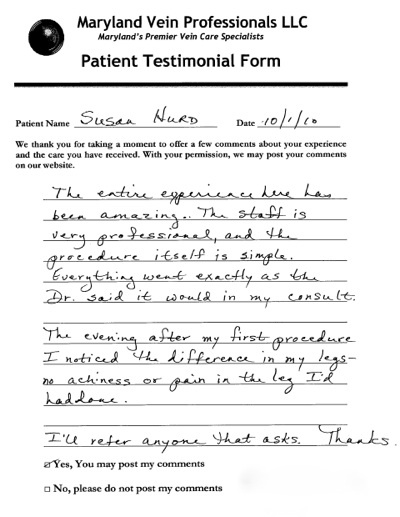 As the leading vein treatment center in America for the VNUS Closure, Maryland Vein Professionals receives many varicose vein testimonials from our patients. Today’s blog contains a few letters about varicose vein treatments. Susan Noticed No More Pain. Everything went exactly as the doctor said it would in my consult. The evening after my first procedure I noticed the difference in my legs no achiness or pain in the leg I’d had done. Felicia Feels Much Better Without Major Surgery. Jonathan Is Riding His Bike More Often Now. For More Information About Varicose Vein Treatments, Contact Us Today. To read more of our varicose vein testimonials about the VNUS Closure Procedure, or to find out more about varicose vein treatments, please visit MDVeinProfessionals.com Or call us at 877-7-MD-VEINÂ for a free physician screening.